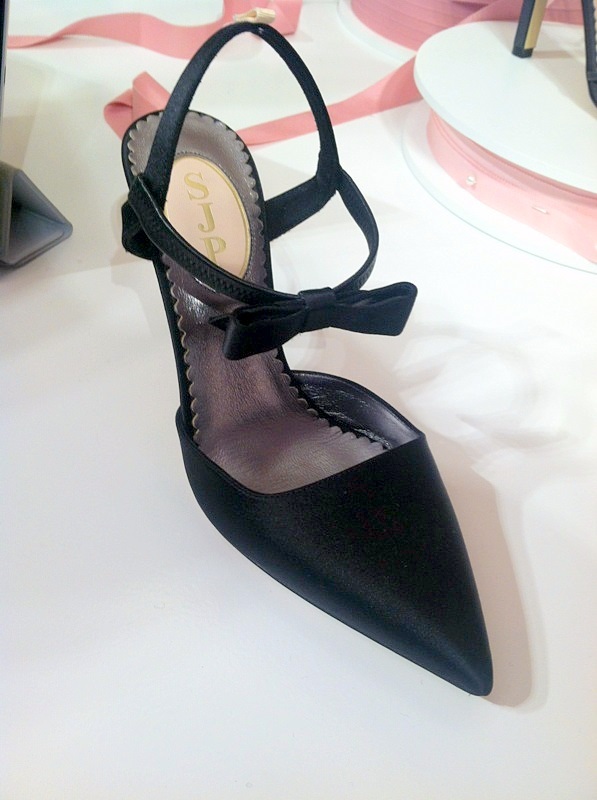 This weekend we embarked on a journey to Sarah Jessica Parker’s pop up shop in SoHo. Upon arriving at the location (Broome & West Broadway), we were forced into a line of eager girls and women, all ecstatic to catch a glimpse of “Carrie”. (Note: not many in line referred to the actress by her real name, but rather ‘Carrie Bradshaw’.) After about thirty minutes of waiting in the brisk, winter air we were taken inside to a sea of gorgeous heels. Although prices have been posted online for months now, the numbers were still set surprisingly high for a celebrity designer – think Jessica Simpson’s line where shoes are rarely more than $150 – Sarah Jessica’s line is the crème de la crème of celebrity-made fashion. Each heel (or flat) is given a name and 9 out of 10 times it has several other color options. Salespeople are there to help each individual – being that those in line are let in by twos, this process goes by rather smoothly. We tried on ‘The Carrie’ – Parker’s fabulously crafted ode to the character that redefined New York City fashion. Although The Carrie shoe is gorgeous to look at, it’s extremely dainty; definitely not something that could get everyday use. After accepting defeat, we moved on to ‘The Alison’ – a gorgeous lace-up calfskin bootie in it’s only color – ‘luggage’. The bootie, which retails for $485, is a stunning piece of footwear; everything about the bootie, down to its stitching, is extremely well made. As we proceeded to try the line on, a woman approached us to inform us that “Sarah Jessica will not be taking photos or signing anything unless you’ve purchased a pair of shoes.” Admittedly, we found this to be extremely tacky but also extremely business smart. We moved on to ‘The Fawn’ – a pair of heels that will stop the room once you enter in them. The heels, in a peculiar shade of teal, were screaming our names! We asked our lovely salesman if he could find our size… four minutes later he returned with “the last pair of The Fawn!” Lucky for us, it was in our size! The Fawn retails at $350 – one of the more reasonably priced items in the line – and proudly display on the soles that they were made in Italy. Another surprise to be noted is that Sarah Jessica also designed a trench coat that lacked in appeal compared to the abundant amount of gorgeous heels. Ready to checkout, we waited in another line for all of twenty minutes until we got to meet the woman of the hour – the gorgeous Sarah Jessica Parker. The designer was thrilled to see that we were purchasing The Fawn, telling us that we had the right personality to rock them – she then proceeded to sign both of the soles of the heels and the box that they came in and then snapped several photos with us. You can see The Fawn in the slideshow above along with photos of some of the standout shoes from the line!